On Thursday, Roush showed off its latest product, and it has its sights set on the off-road crowd. Meet the Roush F-250. It’s the first time Roush has ever added an F-250 pickup to its roster of vehicles, and it maintains Ford’s high towing and payload capacities. Although the powertrains remain untouched, Roush has given the F-250’s suspension a thorough upgrade. The pickup features Fox 2.0 Performance Series suspension system, 1.5-inch leveling kit, 20-inch Roush wheels, and BFGoodrich KO2 All-Terrain 35.3-inch tires. To let onlookers know this isn’t a typical F-250, Roush has added a unique grille with integrated accent lighting. The front bumper, though modified, still works with Ford’s available adaptive cruise control system as well. Finally, body-color matching fender flares beef up the pickup’s exterior to create an imposing look. As if the F-250 Super Duty wasn’t a macho-looking machine already. Inside the Roush F-250, the unit added custom headrests, a serialized console badge, and custom floor liners by WeatherTech. Roush will back all of its upgrades with a 3-year/36,000-mile warranty as well. 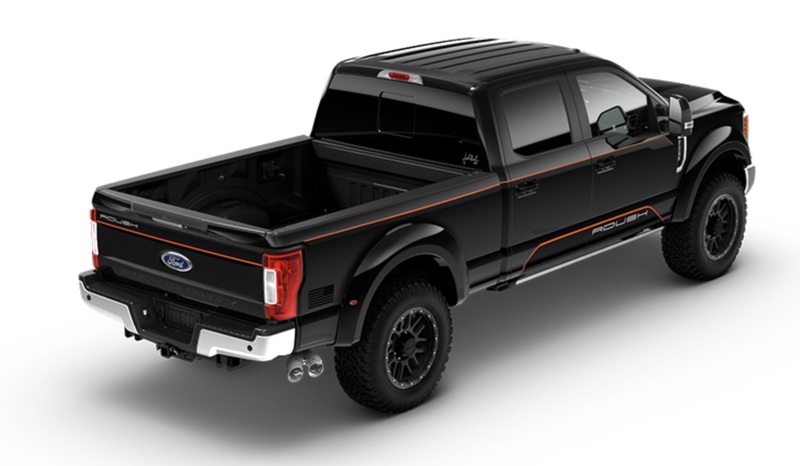 Pricing will start at $13,800 for the package atop the price of an F-250, and Roush encouraged customers to visit their local Roush dealership for additional information. Next story Who Is Mark Rushbrook, Ford Performance’s New Motorsports Boss? Hmmmm. $14k? For a meager lift kit, wheels, tires, shocks, a little body kit, some pin striping and accent lights, and of course, floor mats. Bet they have $4k in parts, $1k in labor, and $9k in profit.